Otterlo is a village in the Ede community of the Gelderland Province. The village and its surroundings count 2,380 inhabitants. Near Otterlo lies De Hoge Veluwe National Park. It also has one of the entrances to the resort. 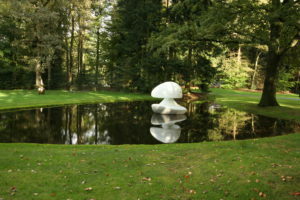 The park houses the Kröller-Müller Museum, which has a Vincent van Gogh collection among others. 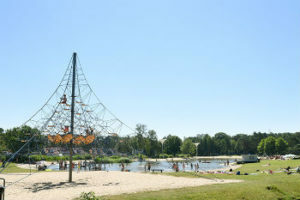 Situated close to the De Roek holiday resort is the natural lake De Zanding open for swimming and lying on the beach in summer. There is a large adventure playground at the lake. De Roek guests get a €1 discount on the entrance fee of €3. Otterlo is an ideal start for your bike hike; bikes can be rented at three locations in our village. Closest to De Roek is the Van Baalen family at the 47, Arnhemseweg, telephone 0318-591425. In the center of Otterlo you will find Bike rentals Geert. It is a bit farther away, but it is en route to De Hoge Veluwe National Park. Geert is also a bike repairman. The National Park has the well-known white bikes. These are free of charge within the Park. At the bus stop on the Apeldoornseweg the OV bikes are on display for rent. 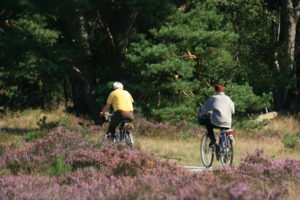 One possibility to explore de Veluwe on bike is by using the de Veluwe bike routes. These series of routes have been developed by the local tourist office. So, anyone using one of the de Veluwe bike routes, can be certain to visit the most beautiful places on de Veluwe. Cycling on a de Veluwe bike route means enjoying everything de Veluwe has to offer. The series of bike routes has over 200 titles. At the Otterlo tourist office you will find the routes for the series applicable to your surroundings. These routes are also sold at De Roek holiday resort.